Brands are not to be dictators. Tides had changed. Any brand that is not listening to its customers today is already buried. Communication had changed from what it used to be. The law of marketing also is changing. Part of communication tools which make brand succeeds is campaign. It is a great tool of communication and once a while we must embrace it. I like the way business directory defines a campaign. It says ‘Complete, planned course of action formulated to achieve defined objectives in marketing, public relations, quality enhancement, revenue generation, safety standards etc’. So once a while, campaigns are necessary to achieve a communication purpose. Communicators and brand owners must continue to use this to achieve both short and long term goals. But while this is a great tool, efforts must be made to ensure there is no fall out and where there is one, effective remedy and solutions must be put in place to gain target’s acceptance. The way brands handle it’s campaigns fallout will determine what happens next. Once, the food giant, McDonald’s campaign hashtag was hijacked by mischievous elements online. But the digital eat responded well and g’ain the support of their audience. In Nigeria, we have another excellent management of a campaign fallout. Access Bank Plc ‘ team approach to the fallout was fantastic and should be commended. Here is the case study. As part of visibility goal Access Bank Plc placed an ad on a national newspaper. A campaign which was later picked up by online influencers. A published advert in ‘The Punch’ Newspaper on that same day was considered as offensive to women folk. This was not intentional. Probably the graphic designers or copy editor of the said advert as well as entire corporate communication team, Corporate social responsibility/sustainability team did not see any evil before it was allowed to go to the press. Unfortunately the advert generated more negativity than the expected publication objective. To add insult to injury, Access Bank social media team also used the advert online which added to the damage. As soon as Access Bank’s media team noted it was generated negative coverage, the digital team deleted the advert online, came out with strong apology without given excuses or tried to justify its position. 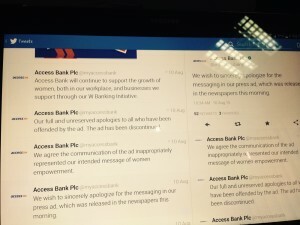 The Web Team immediately posted 4 tweets which acknowledged Access Bank’s fault, made known its position about women and went ahead to say it will never happened. 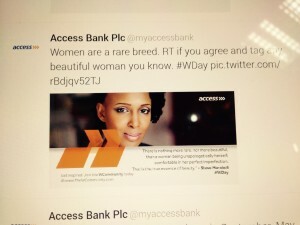 These four tweets got @myaccessbank about 243 re tweets altogether with Millions of impressions as the tweets enjoyed re tweet from major online influencers like Tolu Ogunlesi and Co. Just to strengthens its position, today @myaccessbank is asking its followers to help strengthen its strong positive opinion about womenfolk. As at the time of going to the press, this tweet has enjoyed about 6 retweet. Acknowledge: when there is a communication fallout with your target, seek to understand and not to be understood. A brand can save itself a lot when it just acknowledges and voices its regret. Always see issues from your customers’ perspective. They can help you succeed. Without them you have no future. 2. Make a strong positive position known: it is not enough to acknowledge your fault, it is good to come out with a strong positive emphatic , sympathetic position on the issue. Access Bank social media team did a good job here. 3.Do not waste too much effort: Access Bank did not waste its effort trying to say the obvious. Just 4 tweets. At a time like this, you cannot become talkative, say what you have to say, say it affirmatively and with remorse (if need bee) and move on. 4. Positive engagement comes as a result: as a result of effective management of a campaign fall out, a brand will gain more. When you work hard, plan ahead and trouble shoot In advance what may happen. That will help. 5. To avoid future occurrence, it may not be improper to cross check an ad copy with sustainability department, legal, marketing or other department’s head.